If you’ve been following this blog for a while, you may remember that I have made the acquaintance of a poet called Celestine through her comments, and I have made reference to the haiku that she shares on her blog, Reading Pleasure. I subscribe to this blog, and so Celestine’s haiku pop into my inbox on a regular basis. Haiku is, because of its apparent simplicity, more often a travesty of poetry, inane, banal and derivative, but Celestine has adapted this form to create small jewels of thought. Often I find her words consoling, sometimes they lead me to pause and wonder. And I have wanted to have them, not just in ephemeral cyberspace, but mine to have and read whenever and wherever I like. Today, to my delight I have discovered that Celestine has published a collection, Haiku Rhapsodies, and although I can only have it in a Kindle edition, I bought it immediately. (I really want a print edition, to keep by my bedside, to read as I read the Meditations of Marcus Aurelius, much as many would read a Bible). I can quote one from Afriku because it is part of the product description at Amazon. Just eleven words, and yet immediately we feel it. A beggar has spent all day fruitlessly. He, or maybe she, has nothing. Nothing at all. There is no judgement, no appeal to the western pocket yet we know that this powerful image is representative of a great injustice in our world. You can read a review by Gillena Cox at Lunch Break and buy this lovely collection from Amazon. 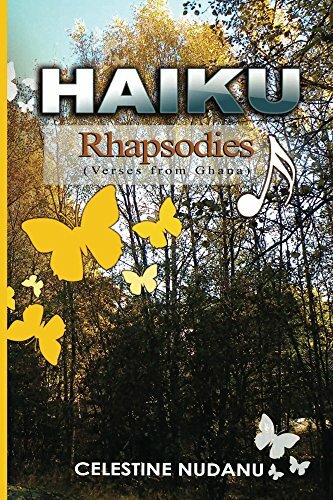 That’s a link to Amazon.au, UK and US readers will need to use their own sites, just search for Haiku Rhapsodies. I have also reviewed it at Library Thing as well as at Goodreads, and I Tweeted it and added it to my ANZ LitLovers Facebook page as well. But alas, I do not review books on Amazon, not ever. However what a friend could do for you is to add this link to a review of hers, and that would bring readers here to see it.